William B. Eerdmans Publishing Company, 9780802829214, 462pp. 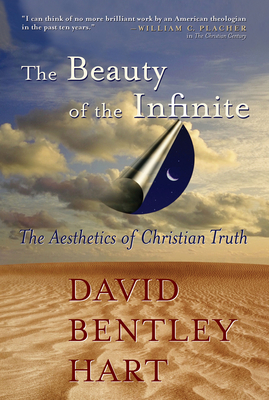 The Beauty of the Infinite is a splendid extended essay in -theological aesthetics.- David Bentley Hart here meditates on the power of a Christian understanding of beauty and sublimity to rise above the violence -- both philosophical and literal -- characteristic of the postmodern world. The book begins by tracing the shifting use and nature of metaphysics in the thought of Kant, Hegel, Nietzsche, Heidegger, Lyotard, Derrida, Deleuze, Nancy, Levinas, and others. Hart pays special attention to Nietzsche's famous narrative of the -will to power- -- a narrative largely adopted by the world today -- and he offers an engaging revision (though not rejection) of the genealogy of nihilism, thereby highlighting the significant -interruption- that Christian thought introduced into the history of metaphysics. This discussion sets the stage for a retrieval of the classic Christian account of beauty and sublimity, and of the relation of both to the question of being. Written in the form of a dogmatica minora, this main section of the book offers a pointed reading of the Christian story in four moments, or parts: Trinity, creation, salvation, and eschaton. Through a combination of narrative and argument throughout, Hart ends up demonstrating the power of Christian metaphysics not only to withstand the critiques of modern and postmodern thought but also to move well beyond them. Strikingly original and deeply rewarding, The Beauty of the Infinite is both a constructively critical account of the history of metaphysics and a compelling contribution to it.